The annual sub-regional meeting for Central Asian republics on ICT in Education took place in Astana, Republic of Kazakhstan on the timely and relevant theme of “Unleashing the Potential of ICT for Skills Development”, focused on developing a well-educated and skilled society. As relevant education and labor-market responsive training systems are of great importance, the Central Asian countries discussed the ways in which to increase their competitiveness and examined challenges of the sector, while exploring the ways in which ICTs can contribute to addressing challenges unique to this context. Additionally, the focus on skills development has been given considerable attention in the Education 2030 agenda, where it is identified as one of the priority areas in achieving the Sustainable Development Goal 4 (SDG4) on education. In this regard ICT has been considered as a supporting resource to pave the way towards lifelong learning, quality education, diversified learning pathways, and reach marginalized and underserved communities. In light of this theme and the potential of ICT, CASIE 2016 focused on 4 areas, specifically 1) providing open, flexible and blended learning opportunities for all, 2) supporting practice-oriented authentic learning experiences, 3) strengthening data-informed education and training policy development, and 4) promoting partnerships for mainstreaming ICTs in education and training. With the support from the Government of the Republic of Kazakhstan, the National Commission for UNESCO of the Republic of Kazakhstan, Korea Education and Research Information Service (KERIS), UNESCO Almaty, and Intel, UNESCO Bangkok together with its partners provided policy platform for almost 70 participants, namely Ministry of Education officials from five Central Asian countries (Republic of Kazakhstan, Kyrgyz Republic, Republic of Tajikistan, Republic of Uzbekistan and Mongolia), as well as local and international speakers and experts who represented more than 10 countries, such as Korea, Uzbekistan, Russia, Switzerland, Finland, Mongolia, France, Germany, Kazakhstan, and more. Due to the relevance and high demand for discussion and exploration of ICT in TVET, participants and experts were engaged in rich and fruitful discussions during plenary sessions and afterwards to collaborate or learn from each other, at national, sub-regional, and international levels. The event also received considerable media attention in the country due to the press release and press conference that took place in the morning of Day 1, with the Vice Minister, Ms Elmira Sukhanberdieva, representing the Ministry of Education and its support of the given event in the country. Additionally, through country presentations and the roundtable discussion, the delegates had the opportunity to share their initiatives as well as areas for collaboration and expertise with participating countries, partners, and governments in the region and beyond. 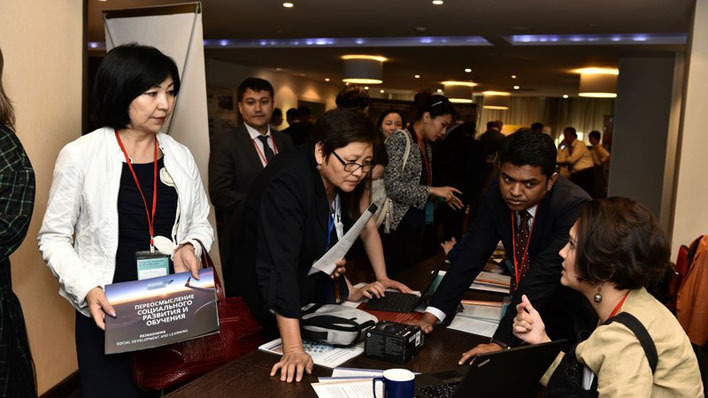 The exchanges during the Gallery Walk prompted further discussions and collaborations in regard to ICT for education and training within Central Asia and beyond, with other partner organizations. Some of the featured projects and resources included the ASEAN Cyber University Project, UNESCO ICHEI ‘Empowering Higher Education for Sustainable Development’ mandate, UNESCO IITE’s support in Teacher ICT Competency and Professional Development, UNESCO Bangkok’s Directory of Free Educational Resources for Teachers, and Distretto Digitale by Mastertraining Srl from Italy, as well as representative vocational schools from each province of the Republic of Kazakhstan. Set up as an open space with demo stations, all participants were encouraged to exchange lessons learned and best practices, collaborate, and provide feedback. Two parallel workshops were also held by UNESCO UNEVOC and UNESCO IITE on the UNEVOC Network and as part of the UNESCO TVET Study in Central Asia, respectively. The sessions provided participants with ideas on how to utilize the UNEVOC Network and become its active members, as well as answered the necessary questions to the UNESCO team for the Central Asian Study on TVET developments as part of country delegations. Finally, the participants had a chance to visit two study sites, a Nazarbayev Intellectual School featuring the latest technologies and methods of pedagogy, as well as the State Municipal Enterprise Akimat of Astana City College of Technology, providing vocational education and training to underprivileged youth. Both locations showcased the various technologies utilized to better prepare students for the future world of work and equipping them with the relevant skills to perform well at the workplace. Overall, the Symposium proved to be highly relevant and demanded, collecting many positive reviews from participants as well as suggestions for future improvements for the upcoming CASIE, with UNESCO and KERIS committing to continuously support this event as a sub-regional platform on ICT in Education.